Think you “don’t have time to pay attention to every horrible policy decision that’s coming down the line!”? Neither does nonprofit phenom Vu Le, but he’s making an exception in today’s edition of his blog, Nonprofit = Awesomely Fun, (formerly Nonprofit with Balls). Vu perhaps speaks for tens of thousands of nonprofit professionals when he writes, “But, as boring as the Johnson Amendment is, it has served our community well for over 60 years, and now it is being threatened. Our sector and the people we serve could be seriously screwed if we don’t do something now. 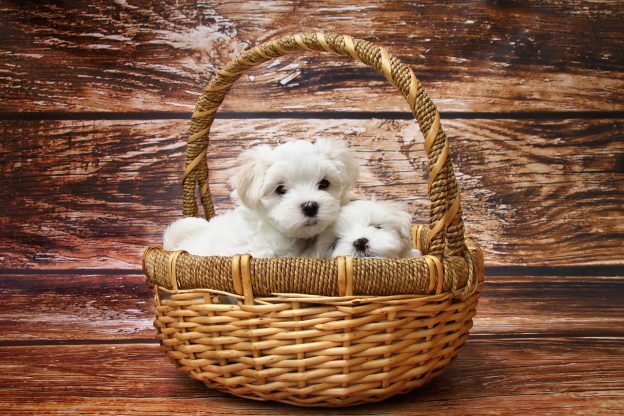 So I am asking you … to sign this letter if you haven’t.” Read Vu’s blog posting, “These adorable puppies need your help to keep the nonprofit sector nonpartisan.” And share with colleagues and family members (to show that you too are cool). The on-again, off-again schedule for Senate action on legislation to repeal and replace the Affordable Care Act (also known as the ACA or “Obamacare”) faces a significant procedural showdown this week as Majority Leader McConnell (R-KY) asks for a vote to proceed to an open debate on Obamacare repeal. The most important question for the public and many Senators is – will the Senate be asked to vote to proceed to debate repeal of Obamacare, or to amend one of many repeal and replace bills. Nonprofits with strong feelings on either option are encouraged to call their Senators (202-224-3121) before the vote on Tuesday, July 25. Several Republican Senators have said previously that they would vote against opening the debate because of significant concerns about the House-passed bill and various drafts of the Senate bill. Some argue the bills don’t go far enough in repealing the ACA, while others contend they go too far and will hurt millions of Americans and state finances. The goal of those seeking to repeal and replace has been to debate the bill under budget reconciliation rules that prevent a filibuster and allow provisions to pass by a simple majority vote. Last week, however, the Senate Parliamentarian ruled that provisions in the bill related to abortion, incentives for individuals to purchase insurance coverage, and funding cost-sharing subsidies would not be protected under the budget rules and would essentially need 60 votes to remain in the bill if challenged, which is expected. Both the Congressional Budget Office and Joint Committee on Taxation estimate that the latest draft of the Senate’s draft Better Care Reconciliation Act would reduce federal deficits by $420 billion over the next 10 years, but also increase the number of people who are uninsured by 22 million in 2026 relative to the numbers of people uninsured under current law. The House of Representatives may vote this week on its proposed budget resolution for fiscal year 2018 that was approved along party lines last week in the Budget Committee. The budget resolution, which is a guiding blueprint rather than binding legislation, calls for significantly increasing defense spending over 10 years while cutting nondefense discretionary spending to just $424 billion a year, down from the $554 billion in that category this year. Most cuts would come from domestic programs, such as healthcare, child care services, the arts, housing programs, services for people with disabilities, environmental protection, and others that typically are performed by nonprofits in communities on behalf of governments. The budget resolution also directs 11 authorizing committees to craft legislation to reduce the deficit by a minimum of $203 billion over 10 years. Among them, the Ways and Means Committee would be expected to produce a comprehensive tax overhaul that addresses simplification, lower marginal rates for individuals and corporations, individual tax bracket consolidation, alternative minimum tax (AMT) repeal, and transitioning to a more competitive system of international taxation. The instructions to the tax committee also call for cuts to mandatory spending programs, including Medicaid and Medicare, and recommends new work requirements for a variety of federal programs such as Temporary Assistance for Needy Families (TANF) and Supplemental Nutrition Assistance Program (SNAP). Signs of Deregulating OMB: The Office of Management and Budget is reducing its internal bureaucracy and red tape in relation to managing federal grants to governments and nonprofits, according to an OMB memorandum published last month. Among other things, the Trump Administration is disbanding the Council on Financial Assistance Reform (COFAR), a group of federal agency financial officers that advised OMB during the development of the Uniform Guidance grants reform. Also, federal agencies will no longer be required to collect certain performance measurement data regarding the impact of the Uniform Guidance. It is unclear whether or how these changes will affect enforcement of the protections in the Uniform Guidance as they relate to nonprofits. Readers are invited to share with the National Council of Nonprofits their experiences with implementation of the Uniform Guidance. Heads Up for New Hires: The U.S. Citizenship and Immigration Services released a new I-9 form for verification of employment eligibility that must be used by employers starting September 18, 2017. The changes are mostly technical and are explained in more detail in the newly revised Handbook for Employers: Guidance for Completing Form I-9. President Trump’s proposed budget calls for significant reductions in funding for the Older Americans Act (OAA) Nutrition Program, as well as the elimination of the Social Services, Community Services, and Community Development Block Grants that also support many of these community-based senior nutrition programs. The proposed cuts come at a time when Meals on Wheels programs are serving 23 million fewer meals today than in 2005 due to funding that has not kept pace with inflation or the rapid and consistent growth in America’s senior population. To urge Congress to protect and increase critical federal funding sources, the Meals on Wheels network has launched a nationwide effort: #SaveLunch. The network is engaging supporters, volunteers, and the general public alike to make a collective appeal to Members of Congress to #SaveLunch for seniors during the Fiscal Year 2018 appropriations process and make sure that no senior is left hungry and isolated. For more information about the #SaveLunch campaign, visit SaveLunch.org or contact advocacy@mealsonwheelsamerica.org. Three and a half weeks into the state fiscal year, many states continue to struggle to balance revenues with spending plans. One reason for the challenge is that state income tax receipts for April 2017 declined by four percent over the previous year, with tax declines largest in the New England and Mid-Atlantic states, according to a new report from the Rockefeller Institute of Government. 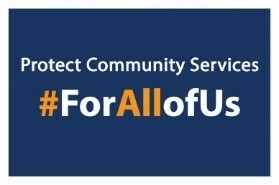 In Connecticut, where the Governor, House, and Senate continue to offer conflicting proposals, nonprofits are planning a day of advocacy, dubbed #ForAllofUs, to draw attention to how spending cuts are affecting individuals in legislative districts. Pennsylvania Governor Wolf is allowing a $32 billion budget to go into effect without his signature, but also without a plan in place to pay for it – thus averting a government shutdown but not a fiscal reckoning. Other states are not without their own challenges. Illinois’ Comptroller is warning that despite the formal end of the state’s budget stalemate – which includes higher taxes and expected increased revenue to state coffers — there is no quick fix for eliminating the pile of unpaid bills to nonprofits and others that total nearly $14.5 billion. Louisiana is also at risk of revenue shortfalls, causing the state’s Bond Commission to start the process for borrowing up to $500 million in anticipation of the state government needing the money. Nonprofits owning and using property in Michigan for their charitable missions won a tremendous victory last month when the state Supreme Court overruled tax assessors and the lower courts by clarifying the rules for when organizations are entitled to tax exemptions under state law. At issue was the denial of a property tax exemption sought by Baruch Senior Ministries for an adult foster care facility. The tax assessor reviewed the six-part test under state law and claimed that the facility discriminated in its charity care by only providing income-based subsidizes to longer-term residents. The Michigan Supreme Court rejected the assessor's ad hoc determination and ruled that the criteria of offering charity is satisfied so long as restrictions or conditions that the nonprofit imposes bear a reasonable relationship to the charitable purpose of the organization. The Michigan Nonprofit Association and its members have been fighting the tax assessors in both the courts and the legislature. Last session the state association of nonprofits promoted legislation to fight the increasing occurrences of local tax assessors challenging nonprofits and their property tax exemption. The nonprofits, located across the state and representing a wide variety of charitable organizations, are being challenged on whether they should be considered charitable. The legislation would have brought clarity and consistency to the process, which is based on a previous state supreme court case setting forth the six factors to determine charitability and thus exemption. The recent Supreme Court case provides needed clarity on one of those six factors. Taxes: After months of doubt, the County Board of Commissioners in Omaha, Nebraska voted to extend the property tax exemption for Goodwill Omaha. The nonprofit had come under scrutiny after the local newspaper ran a series of investigative reports about high salaries, apparent conflicts of interest, and governance problems. The Douglas County Commission voted 6 to 1 in favor or extending the exemption, but Commissioners made clear that they want to see continued progress and transparency from the organization. PILOTs: City officials in St. Paul, Minnesota are looking for ways to tap nonprofit resources to fund city expenses, and payments in lieu of taxes (PILOTs) are under active discussion. Last year, the state supreme court struck down a controversial right-of-way charge to nonprofits that the city called a “fee” and the court determined was an illegal “tax” on tax-exempt nonprofits. A committee led by the Citizens League is exploring ways to address the local government’s budget challenges, but is finding that much of the rhetoric and assumptions about the impact of nonprofit property ownership in the city have been grossly overstated. For instance, the claim that a third of the property is exempt from taxation is not true. In fact, only 25 percent of the land in the capital city is off the tax rolls, and 60 percent of tax-exempt properties in St. Paul is owned by governments, not nonprofits. CalNonprofits, the state association of nonprofits, and the California State Association of Counties (CSAC) are teaming up to provide joint training for nonprofit and county staff on the OMB Uniform Guidance. The federal grants reforms promulgated in 2014, among other things, require state and local governments to reimburse nonprofits for their indirect costs when performing services that are funded in whole or in part by the federal government. Joint training of both sides of the government-nonprofit contracting and grantmaking relationship guarantees that all are receiving the same information, plus it helps build relationships across the sectors. The work on the part of CalNonprofits is part of its Nonprofit Overhead Project, which includes a regularly updated website on overhead, promotes advocacy with foundations and government officials, sends out member alerts, and ensures that training programs for nonprofits take things a step further. New York City Mayor De Blasio will use increased cultural funding to promote diversity among arts audiences and workforces, according to the new CreateNYC cultural plan released last week. Under the plan, the City will consider diversity among board members and staff, and an organization’s plans to boost diversity, as factors in a competitive grant process that provides funding to almost 1,000 museums and organizations, the Daily News reports. “If we are going to continue to live up to that title [of ‘the world capital of art and culture’] we must use every tool we have to ensure that every resident, in every neighborhood, has the same access to cultural opportunities,” Mayor De Blasio said in announcing the plan. “CreateNYC is the first comprehensive roadmap to lifting up arts and culture across the city – now it’s time to roll up our sleeves and get to work." See the news release for more information. Methodist Pastor James Brigman arrived in Washington, DC today, July 24, after walking for two weeks from his home church in Rockingham, North Carolina. He has been walking to raise awareness about medically fragile adults and children (including his daughter) whom he believes are being put at greater risk because of proposed federal spending cuts to Medicaid. His march is a personal protest, and one that is attracting a great deal of attention and support. The walk has the full support of the North Carolina and Virginia Conferences of the United Methodist Church. Local churches have been alerting their congregations to his progress and local pastors have been opening their homes for meals and overnight stays. News coverage has been extensive, leading to folks joining Rev. Brigman for part of his day’s walk and wearing tee-shirts declaring “Voice for Lauren Faith, Medicaid Matters,” referring to the Pastor’s daughter. 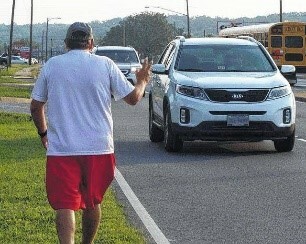 The walk inspired a Facebook page that has attracted scores of postings from parents supporting the effort. Parents and others are posting pictures and videos of children alive today because of Medicaid. Twitter handles include #Walking4Medicaid, #Faith4Medicaid, and #ProtectOurCare. 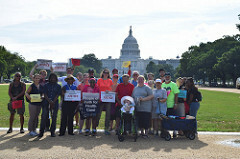 The 375-mile march ended today with morning prayer at the Jefferson Memorial, a news conference at the Washington, DC offices of the United Methodist Church across the street from the U.S. Capitol, and a meeting with Senators. Rev. Brigman told the interfaith prayer seervice at the UMC offices, "I started walking for Lauren and to teach others that Medicaid is for the common good." But What About the Johnson Amendment? 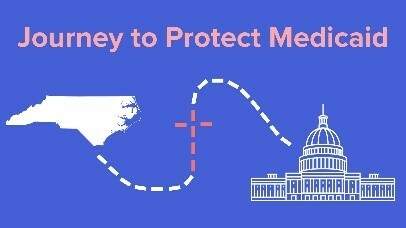 Isn’t expressing opposition to President Trump’s proposed Medicaid spending cuts a violation of the Johnson Amendment? Not at all. The final clause of the Internal Revenue Code Section 501(c)(3) – the law known as the Johnson Amendment – prohibits charitable nonprofits, houses of worship, and foundations from endorsing or opposing candidates for public office or contributing organizational resources to partisan campaigns. Rev. Brigman isn’t talking about candidates or telling people how to vote on candidates for public office. He’s advocating about a critical issue of the day. Here’s what he said at this morning’s interfaith prayer service: “Humanitarian work and social justice, it’s not about political sides or views. It’s about loving each other. And we have to set aside any differences and just love one another. And that’s what message we want to give to senators and different ones we talk to.” The Johnson Amendment has no bearing on his activities. But is advocating on a legislative matter allowed by a preacher or other nonprofit professional? Yes. Rev. Brigman’s walk is focused on a public policy question: what is the proper level of funding for Medicaid? The second clause of Section 501(c)(3) of the tax code supports limited lobbying rights of charitable nonprofits. And in his personal capacity, James Brigman can lobby without limits under the tax law. One doesn’t have to share his views on Medicaid funding levels to respect Rev. Brigman’s courage and perseverance. We suggest contacting him thorough the Facebook page. The fundamental of nonprofit nonpartisanship is under attack in Congress. Join more than 5,000 organizations – charitable nonprofits, religious institutions, foundations, and for-profits from all 50 states plus DC – by signing the Community Letter in Support of Nonpartisanship. Learn more in the July 18 special edition of Nonprofit Advocacy Matters and at www.GiveVoice.org. - Portion of letter from the museum community to congressional leaders making the case for maintaining funding for the National Endowment of the Arts, National Endowment for the Humanities, and the Institute of Museum and Library Services. - The Week in Public Finance, Liz Farmer, Governing, July 21, 2017, excoriating Alaska lawmakers for causing their state to suffer two credit downgrades due to their reliance on “rainy day funds” rather than addressing the structural deficit resulting from the decline in oil revenues. “Measure easing regulation on pulpit politics is unpopular,” Raleigh (NC) News & Observer, July 22, 2017, providing a collection of five letters to the editor opposing efforts in Congress to gut the law known as the Johnson Amendment, including this observation: “the Johnson Amendment of 1954 has contributed to keeping the peace within many congregations. If the churches were given free rein to support one and oppose the other political party without losing their tax-exempt status, they would turn into political action committees inviting and accepting financial support from political power players.” See also Politicizing churches and nonprofits would harm NC communities, David Heinen of the North Carolina Center for Nonprofits, News & Observer, July 21, 2017. Recommendations of the National Council of Nonprofits on Comprehensive Tax Reform, submitted July 17, 2017 to the Senate Finance Committee, expanding on the legislative history of the Johnson Amendment, identifying current benefits of the law to nonprofits and society, and explaining the broad free-speech rights organizations currently enjoy. Opposition to Section 116 of the Financial Services Appropriations bill for FY 2018, Letter from the state association network of the National Council of Nonprofits to the House Appropriations Committee, July 13, 2017, signed by statewide organizations in 47 states. Why Charities Shouldn't Start Ignoring the Ban on Partisan Politicking, Matthew Shell, Chronicle of Philanthropy (paywall), July 11, 2017, explaining that the President’s Executive Order has little legal or practical effect because the President cannot repeal the Johnson Amendment and does not have enforcement authority over the Internal Revenue Code. Winners and losers of the biggest state political battles of the year so far, Amber Phillips, Washington Post, July 15, 2017, providing a recap of the key winners and losers during state legislative sessions this year on such issues as state budgets, tax cuts, gay rights, and gun control. Remarks by Rev. 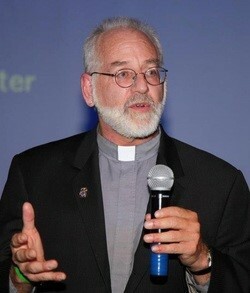 Dr. Rick Schlosser, Executive Director of the California Council of Churches and California Church IMPACT, on a July 12 webinar on the Johnson Amendment that his organization co-hosted with CalNonprofits, the state association of nonprofits in California. Listen now (2:54). The reduction in the amount of regulation volume achieved by the White House Office of Management and Budget through the publication of the Uniform Administrative Requirements, Cost Principles, and Audit Requirements for Federal Awards, commonly referred to as the Uniform Guidance. Through this major regulatory reform effort, OMB consolidated eight OMB Circulars into one set of grants rules that, among other things, mandate that nonprofits performing work for governments utilizing federal funding must be reimbursed for their indirect costs.